Having a quick look at Twitter this morning as I drank my coffee I discovered that today is the 250th anniversary of the eminent English scientist John Dalton, who was born on 6th September 1766. 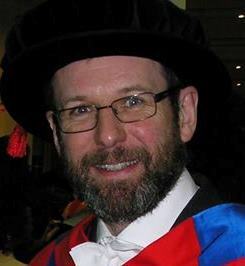 Dalton is most famous in the United Kingdom for his work on chemistry and physics, and somewhat less so for his pioneering studies of colour blindness. I didn’t know until quite recently, in fact, that the birthday of John Dalton, who was himself colour blind, is also Colour Blindness Awareness Day so I thought I’d do a quick post to mark the occasion. You might also be interested in this old guest post on the subject of colour and colour perception. 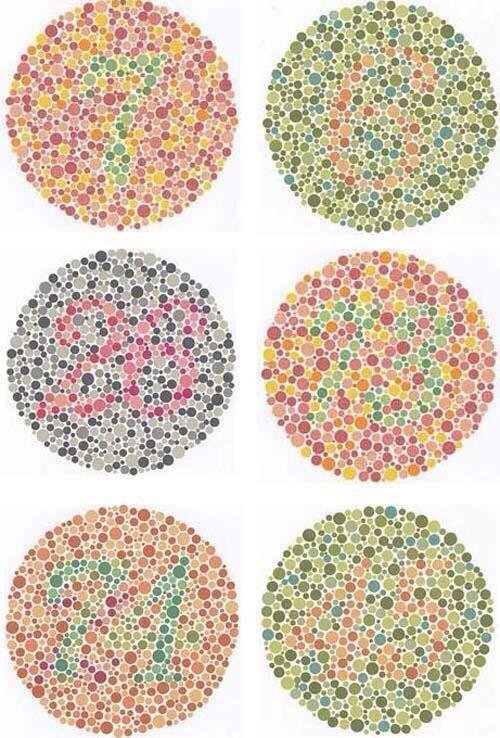 Here’s a test for some of the main types of colour blindness – can you read the numbers? Colour blindness comes in different forms and affects a significant fraction of the population, with a much higher rate of occurence in males (up to 1 in 10 in some groups) than in females (about 1 in 200). It also varies significantly across different populations, with particularly low rates for, e.g., Fijian males (0.8 %) and much higher frequencies among, e.g. Russian males (9.2%). I am not colour-blind myself, but I know several colleagues who are. In fact at the meeting I was at last week, when one speaker decided to show two different sets of results on a graph by plotting one in red and the other in green, there were howls from several in the audience who couldn’t tell them apart. It’s very easy to make careless mistakes like this in preparing lecture materials when it takes only a small effort to make them suitable for all. I urge colleagues who teach to remember that if they are 100 men in the audience the likelihood is that there will be around 8 to 10 who are colour blind. Thinking about this makes you realise how many maps and other designs rely on full colour perception for their effect. 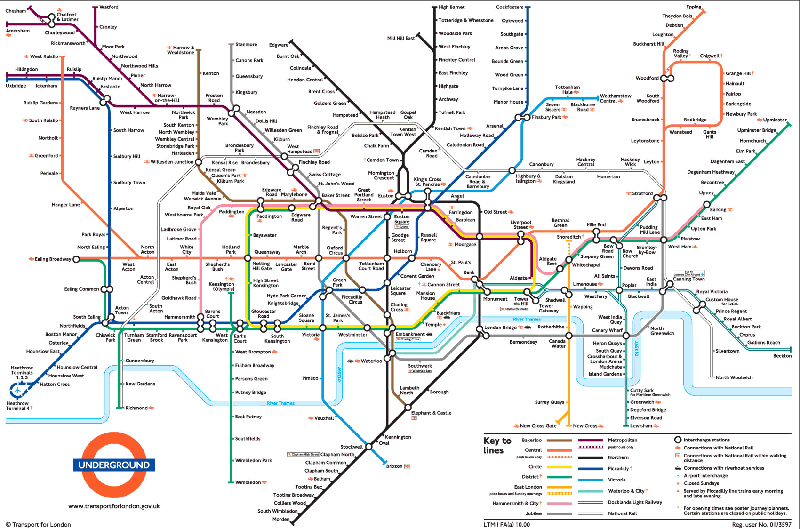 I’ve previously celebrated the London Underground map as an excellent example of graphic design, but it must be a nightmare to a person who is colour blind! It’s also worth mentioning that standard instructions at many institutions for marking examination papers is that the first marker should do them in red ink and the second marker in green…. This all reminds me of the late Professor Francesco Lucchin, who first invited to Italy to work with the astronomy group in Padova back in the early 1990s. Francesco and I ended up writing a book together and during the course of working on that he told me that he was “daltonic”. I later found out that this word does exist in English, but it is not in common usage as a word meaning “colour blind”. The standard word in Italian for “colour blind” is “daltonico” and there are many other variants in other European languages, such as the French “daltonien”. It’s very curious that Dalton’s name is so strongly associated with colour blindness across the European continent but not in the country of his birth. I wonder why this is? By the way, if I understand correctly, the English word “daltonic” refers to a specific form of red/green colour blindness called deuteranopia, whereas the foreign variants can refer to any form of colour blindness. P.S. You would have thought that the 25oth anniversary of Dalton’s birth would at least have warranted a Google doodle, but apparently not. Having a quick look at Twitter this morning as I drank my coffee I discovered that it is the birthday of the English scientist John Dalton, who was born on 6th September 1766. Dalton is most famous in the United Kingdom for his work on chemistry and physics, but somewhat less so for his pioneering studies of colour blindness. I didn’t know until today, in fact, that the birthday of John Dalton, who was himself colour blind, is Colour Blindness Awareness Day so I thought I’d do a quick post to mark the occasion. You might also be interested in this guest post on the subject of colour and colour perception. Colour blindness comes in different forms and affects a significant fraction of the population, with a much higher rate of occurrence in males (up to 1 in 10 in some groups) than in females (about 1 in 200). It also varies significantly across different populations, with particularly low rates for, e.g., Fijian males (0.8 %) and much higher frequencies among, e.g. Russian males (9.2%). I am not colour-blind myself, but I know several colleagues who are. In fact at the meeting I was at last week, when one speaker decided to show two different sets of results on a graph by plotting one in red and the other in green, there were howls from several in the audience who couldn’t tell them apart. It’s very easy to make careless mistakes like this in preparing lecture materials when it takes only a small effort to make them suitable for all. I urge colleagues who teach to remember that if they are 100 men in the audience the likelihood is that there will be around 8 to 10 who are colour blind. Last week I gave a short speech at the workshop to celebrate Sabino Matarrese’s 60th birthday, in the course of which I mentioned the late Francesco Lucchin, who first invited to Italy to work with the Padova group (of which Sabino was a member) back in the early 90s. Francesco and I ended up writing a book together and during the course of working on that he told me that he was “daltonic”. I late found out that this word does exist in English, but it is not in common usage as a word meaning “colour blind”. In fact the standard word in Italian for “colour blind” is “daltonico” and there are many other variants in other European languages, such as the French “daltonien”. It’s very curious that Dalton’s name is so strongly associated with colour blindness across the European continent but not in the country of his birth. I wonder why?